Big Finish: Doctor Who - THE FIFTH TRAVELLER Review | Warped Factor - Words in the Key of Geek. Tony sneaks on board the Tardis. Hopes no-one will notice. It takes real chutzpah to write a story like The Fifth Traveller. It takes chutzpah (or cheek, for those who need the translation) because the central pivot-point of its premise is rrrrrrright there in the title. It takes the Tardis team of the First Doctor, Ian, Barbara and Vicki, and adds an unknown quantity by the name of Jospa, from 30th century Earth, into the mix with no prior backstory, no explanation – he’s just part of the team. That immediately gets your ears pricking up, but it does lead to an immediate, obvious conclusion – that young Jospa’s a wrong ’un, otherwise we’d know about him already. When the team start reminiscing about how he helped them out on Vortis, and in Rome, you’re more or less confirmed in that conclusion, which means you spend the first three episodes essentially waiting for the other shoe of Jospa’s presence as part of the Tardis crew to drop. It would be deeply unethical to tell you whether it actually does drop, or whether writer Philip Lawrence structures the whole thing to pull a fast one on you. What we can tell you with certainty is that by the time you get to the pivot-point on which the future of the crew depends, you won’t realise you’re almost at the end of Episode 3. It’s a fast-paced story this one, rich with the history of the crew’s immediately previous (and unseen) adventure, largely running away from the Verviddick – an aggressive species of warriors with a particular knack for creating living, jellyfish-like technology. But while there’s plenty of running to do in this story too, from plenty of different threats – acid rain, a species of four-armed, legless, yellow-furred, psychic apes (try doing that on a sixties budget, we dare you! ), and a lone Verviddick spy tracking them through the jungle, there’s lots more to it than that too. There are great moments of character interaction between different sub-sections of the Tardis crew; Jemma Powell gets the chance she was denied in The Age of Endurance to stamp her portrayal of Barbara on our memory, thanks to some lovely, warm Barbara-writing from Lawrence, and there’s a chance for Maureen O’Brien to do some pre-Steven Vicki acting, alongside another young orphan, Jospa, played by James Joyce more as the bratty brother she spars with than Steven’s often over-serious protector would ever be to her. There’s a whole political sub-plot too: the Arunde - the yellow-furred psychic apes on this nameless planet - have their own issues, with a young, inexperienced hereditary ruler, or Matriar, who came to power before her mother could teach her all she would need to know. She holds the psychic ‘seeing-stones’ of all her tribe, and can see through their eyes and direct their actions if need-be. Which is all very well and suitably sixties – Matriar Sharna is more or less a guru in all but name. But whereas on sixties Earth, the gurus were a force of revolution against the staid traditionalism of mainstream society, here Sharna is the representation of mainstream society, and she has a revolution of her own to deal with – those who want their own seeing-stones, and the self-determination they will bring, are on the brink of overthrowing their Matriar, especially when strangers arrive on their world, strangers who walk on the ground which most of her tribe fear. She’s left to struggle with dissent in her own ranks, plus the central question of the strangers: whether the ground-walkers are their mortal enemies, or perhaps their salvation from the forces of darkness. It's this richness of world-building, matched with the relatively deft swapping between Tardis sub-groups and peril-sources, that keeps you on your toes all the way through The Fifth Traveller, and adding that richness, the multiple peril-sources and the characterisation to some solidly written moments both for relative newcomer Powell and for James Joyce as Jospa gives you a story that you’ll devour in a single sitting, given a lack of distraction, and go back to again and again. What’s more, the struggles of the Arunde are never tangential to the main Tardis crew plot. In fact, they end up being crucial to the resolution, as Lawrence draws his threads together well, and in a distinctly rounded, satisfying, sixties, fairy tale, happily ever after way. Performancewise, there are a number of highlights here, with special honours going to James Joyce – when the whole crux of a story focuses on a single character and whether they’re good or evil, it’s a very delicate road to walk, a very nuanced performance you need to deliver if the chutzpah of the writing is not to come crashing down in flames of obviousness. Joyce walks that line with confidence, and a brio that helps give Jospa exactly the tone he needs to exist on that knife-edge where we hope for good, but suspect evil. Jemma Powell has much more meat to work with here than in her debut, and gives us a living Barbara more nuanced, almost by necessity, than any previous attempt by other actors to fill in her lines. And Kate Byers as Matriar Sharna brings a fragility and a hope to the character that carries the idea of a young ruler struggling to find her strength as her world begins to slip out of her control. 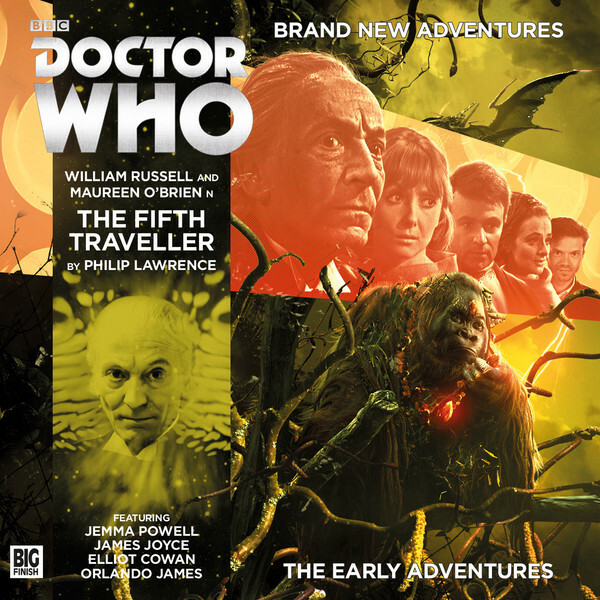 The Fifth Traveller is agreeably rich without being dense, and it moves everything along with a sunlit pace that involves you and pulls you with it, without you ever feeling the need to stand more still than you do. Lawrence delivers a story that can hold its head up among the best of the Early Adventures, and which feels like both a quick listen and a deep one – by no means an easy combination to master. Give it a spin today – it’s well worth the price and will give you plenty of repeat-listening value for money.